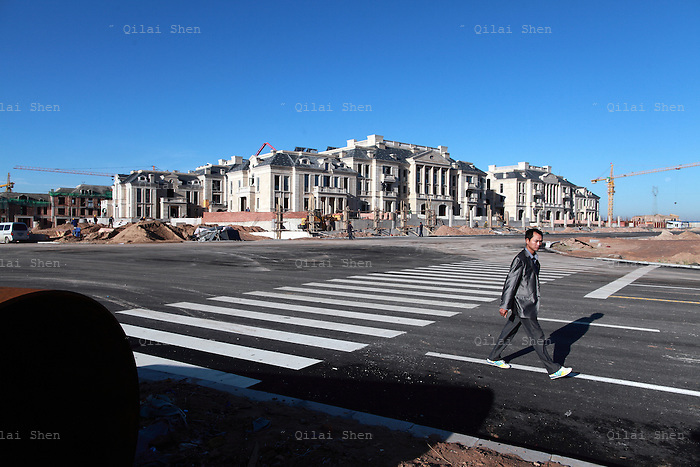 A man walks past at the site of a new luxury housing development being built in the middle of the dessert near the Kangbashi New District of Ordos City, Inner Mongolia, China on 16 August, 2011. With an investment of over 161billion USD from the local government and revenue from the region's rich coal deposits, enough buildings have risen on the site of an old desert village to hold at least 300,000 residents, complete with ultra modern facilities and grand plazas. The district however is less than 10% occupied, dubbed the "ghost city", Kangbashi epitomizes China's real estate bubble and dangers in mindless investment fueled economic growth. In 2011, the real estate price of Ordos city has dropped over 70%.